Top well maintained owner ship with 2 x Volvo Penta D6-370 diesel engine, approx. 30 hours of operation, Electr. Hydr. Bathing platform, Electr. Anchor windlass with anchor and anchor chain, Interior wood color walnut, floor Elm, bow thruster, teak on cockpit floor and side deck, Sun cushions on hood, 2 fridge in cockpit, light package Interior and exterior, camper cover, coffee table ablenkbar with Mattress, darkening salon, aft cabin and forecastle cabin, Salon stool, microwave, high-quality countertop, high-quality cold foam mattress with viscose layer coating, hot air heating 5,5 kW, Fusion Marina audio package, Electr. adjustable trim tabs, Garmin VHF300i radio, Garmin chart plotter 7410, lion 32 "TV, Sony PlayStation. Location: Baltic Sea. 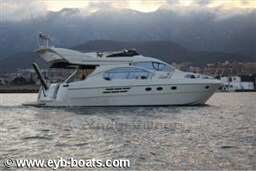 Dear Sirs, I have seen on YachtVillage your offer about Bavaria S45 Sport - 2017 (code: 272850). I am interested in the offer and would like you to contact me. Thank you. If you would like to find out more about this boat and any other boats of this type and range, Digibusiness Srl,the Company that manages YachtVillage, and Mare Soleil Yachthandel GmbH, the Company that exhibits the Boat, must necessarily acquire some simple details about you (name, surname, email address and, if needed, your telephone number). These details will be processed according to the purposes and means of the processing indicated in the privacy statement under the PRIVACY Section of this website, referred to herein.